The official National Institute of Standards and Technology (NIST) Final Report on the Collapse of World Trade Center Building 7 admits that the top of the building accelerated at the rate of gravity for 2.25 seconds into it’s own footprint — 8 stories worth of collapse. The graphic and text above, which is taken from page 45 and 46 of final NIST WTC7 report is based on measurements taken from this video. 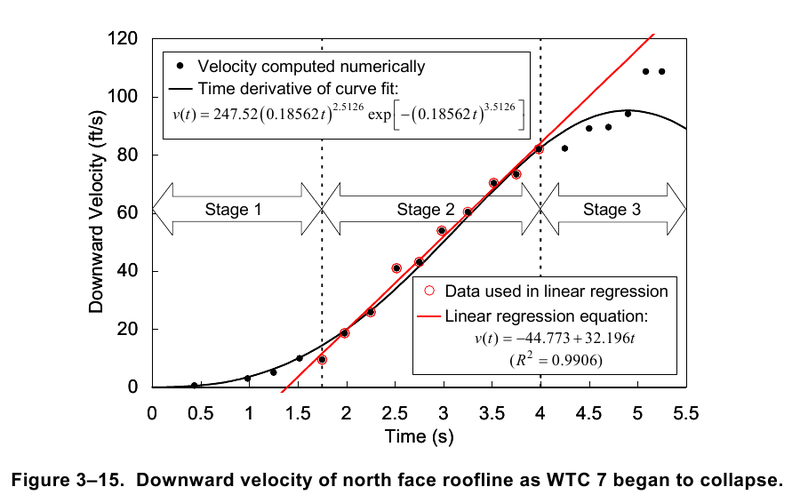 The significance of a period of the building falling with the acceleration of gravity is that this implies that the structure below was offering no more resistance than air and based on the NIST calculations 2.25 seconds represents the removal of 8 stories of the building. The most plausible explanation for the near instantaneous removal of 8 stories of the building is that explosives were used. The key piece of evidence cited to support the conclusion of a controlled demolition consists of an analysis of the physics of the collapse — the building dropped with an acceleration very close to that of gravity… The only way to achieve a collapse of this nature — one which involves the whole building coming down at close to free fall speed, is for all the structural columns to fail simultaneously. This is not something that could be expected to be caused by fires, especially ones which hadn’t even spread across a whole floor, the most plausible explanation does appear to be that it was a controlled demolition. David Chandler, a supporter of AE911Truth.org was key in pressing NIST to look at the issues of the freefall collapse acceleration and has produced a very clear video WTC7: NIST Admits Freefall about this matter and has was interviewed on the latest Visibility 9-11 radio show, his web site is 911speakout.org where there is more material about the structural failure of the WTC buildings. All the publically available videos of the collapse of WTC7 are available on this site: 1 | 2 | 3 | 4 | 5 | 6 | 7 see also New Footage of the Implosion of WTC7 and BBC World footage from 9/11 announcing WTC7 collapse 23 mins before the event.